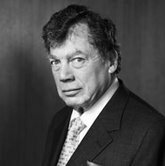 Edgar Bronfman is the son of Samuel Bronfman, the founder of Distillers Corporation Limited, who purchased Seagram's in 1928. In 1957, Bronfman took over as head of Seagram's American subsidiary and, following his father's death in 1971, became the corporation's president, treasurer, and director. In 1981, Bronfman was elected president of the World Jewish Congress, which he led prominently through the campaigns to free Soviet Jewry and to gain compensation for survivors of the Holocaust. Bronfman established The Bronfman Youth Fellowships in Israel and the website MyJewishLearning.com and provided major funding and guidance for reviving the revival of Hillel: The Foundation for Jewish Campus Life, along with Richard Joel.